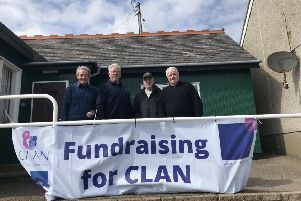 Forward looking Laurencekirk Bowling Club succeeded in a funding application of £4000 from Awards for All which will ultimately help keep its membership growing. The grant, which the club has matched, means it can buy a second Dennis mower, an essential tool for its “Manicured Bowling Green’ project. Not only does the machine cut grass, it also scarifies, spikes and brushes the green. “We are over the moon and the new machine is on order,” said the delighted Club Treasurer, Bill Russell. “The grant has helped us complete our purchase of the additional equipment required to ensure the green is maintained to its optimum condition. “Although the condition of the green is currently considered very good, this is as a result of using the type of machinery we are now purchasing, during demonstrations and hiring one earlier in the year. The new machinery will benefit club members and bowlers from other local clubs, as well as local schoolchildren. And it will enhance a recruitment drive which raised club membership by 40 percent this year. Ultimately it will save the club money by avoiding the need to hire equipment, and help the club’s hard working volunteer greens staff manage the green more effectively. Bowls Scotland Club Development Forum attendees will be well aware of the Awards for All funding, which aims to help people become actively involved in projects that make a positive difference to their local communities. It is also at the top of the list in Bowls Scotland’s Funding Information document. Applications need to demonstrate clearly how the project meets the funding criteria and funders’ priorities, and the process can take some time. But as Laurencekirk has found, the results are well worth the effort. “For the application it was a case of go online, read carefully through it and fill it in as best as you can,” said Bill, who explained the club has engaged with Bowls Scotland’s Try Bowls campaign and its Greens Seminars. It was as a result of the latter that the club first hired the mower before deciding to purchase its own one. “You have to look at the criteria and you have to show the benefit to the bowling club and to the community. We have people of all ages, we are a social hub as well and people can come and watch the bowls. We have coffee mornings, target bowls for the kids and come and try days.